I was really pleased to snap up this vintage Jaeger bargain-my last purchase of 2008. 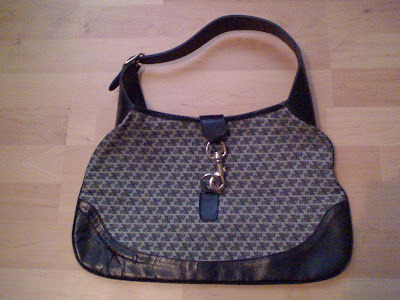 A total classic, it is a navy patterned canvas hobo style bag with leather trimmings and was £3.75 in Cancer Research. It will be ideal to use in any season and is big enough to hold anything, either by hand or over the shoulder. For anyone who thinks it looks familiar, it is virtually the same as the Gucci Jackie O (Bouvier) bag. A great timeless bag that has never gone out of style-my kind of bag! fantastic find sharon. they are both classics. Hi savvy-thanks for your lovely comment! darling your bag is classic,you will be wearing ten years from now. you always find fab stuff. hope your having a good wknd. you get the best bargains! i'm back, by the way! Oh Yes I love the Jackie bag! I have a black suede one that I just cherish! What a great find! Lovely & dream price! Excellent last purchase for the year, looking forward to seeing what 2009 brings you! You always find such great bargains =D! That's a great find. Because it's vintage and broken in, it looks more expensive that something you could get today. I can't wait to see what you wear it with! Happy new year, keep up the great blogging! Nice buy at a nice price. Hi Marian-thanks for your lovely comment my dear! Hi sydney-yay, happy new year my dear! Hi Couture Carrie-yes, a real classic, thanks! Hi kate-thanks so much my dear! Hi janettaylor-yes, the price was good, haha, thanks! Hi skye-thanks my dear, can't wait for somme 2009 bargains! Hi nic-thanks a lot my dear! Hi atelier-yes, thought so! thanks my dear! Hi asiancajuns-thanks for your lovely comment,yes, its a versatile year round bag, I'm sure I'll use it often! Hi devon.maid-thanks for stopping by with your lovely comment!happy new year too! Yet another great buy ! 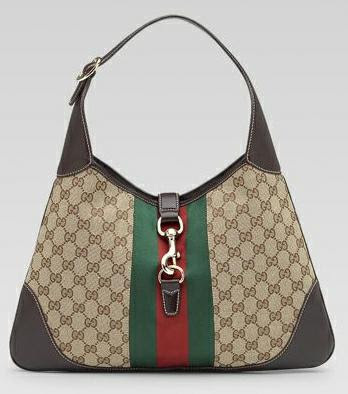 :) It does indeed look a lot like the Gucci bag, so that's another reason to love it. Hi LaMimi-thanks so much my dear! Always still in style. Good stuff. Hi the seeker-thats lovely of you, thanks my dear! Hi ellie-thanks my dear, you're welcome!